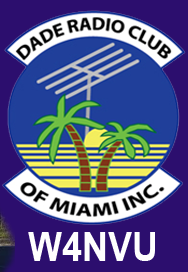 October 2011 Meeting Minutes – W4NVU – Dade Radio Club of Miami Inc.
Meeting was called to order at 19:50 with 29 present. Minutes were tabled until next meeting. Corresponding Secretary – no report. Treasurer’s Report – none. She is not here tonight. Miguel is going to get with Esther to fill out the insurance forms. Membership dues are due. If you pay tonight it is good for the remaining part of this year and 2012. Ryan spoke about the website and news letter. He recently updated the website. 147.000 – Merritt is not here tonight – Miguel spoke to Merritt and John Vecchio to get up there to fix it. 147.760 – Ray said its working. We are on it right now. 224.200 – is still sitting at Robert’s house. 444.200 – Carl said it is working. A new controller will be put in soon. Miami-Dade ARES/RACES Update – Carl gave an update of the frequencies that we are using. There are a total of 38 members and want to expand. See Carl We will be having an exercise the day before Thanksgiving. Needs help with the Dade Emergency Net on Wednesdays. Miguel advised that we now have a PIO (Public Information Officer) and will be here next month. To get more publicity for the club. Miguel updated the members with the Coral Gables Races Net; Everglades Amateur Radio Club Net; and Cutler Bay Races net. Kayak Race went well last month. Thank you to everyone that participated. There is a Dentron, VL2000 Yeasu and a Henry amp for sale. If interested, place a bid. Ray suggested that we put the items on the club website before listing them with EBay or Craig’s List. Hollis asked what was the minimum bid amounts – $400 for the Dentron; $500 for the Yeasu and $1250 for the Henry. These radios were donated by the Boy Scouts. Other items will be put on the website too. The club is raising money to purchase other newer equipment. Other equipment was discussed. Miguel is going to get an estimate on the 430. The items are open for bidding. Once the bids are in, he will call the officers to see if they are in agreement and if they are, will sell. Hamfest 2012 was discussed. It will take place February 4th – the Saturday before the Super Bowl weekend. One week after is the Ft Myers Hamfest. Virgil advised that the Shriner’s building was sold. December 15 is the closing date. He suggested the German American Club. They want $140 per hour for Friday night and Saturday. They are willing to talk. Parking might be a problem. The size of the room is about 2 – 2 ½ the size of our meeting room. Merchandize Mart was discussed. They want $7,000 and $55 for each booth for electricity. Ray suggested the Elks Club at 103 Avenue and Sunset. They have a dinning room like our meeting room here. Tom will check with the German American Club since the reservations need to be made by a member of the club. The dues are $40.00 per year. Lee suggested the Polish American Club on NW 22nd Avenue. They have a large room there. Miguel said it is only going to be a 1 day venue. Robert was supposed to be here tonight to give Miguel some information. Miguel also stated that a gentleman that took a class is a Dade County Assistant Director to the Airport – he may be able to speak to him to get a hanger at Kendall/Tamiami Airport. Tom and Miguel will be working on it. Cub Scout Fun Day is this weekend – Lee and Miguel are taking the trailer. Philippe spoke about the Jr Orange Bowl Parade the 2nd and 3rd of January. During the day until the afternoon. Everyone is welcome. If someone wants to make a float, let Philippe know. The theme is the 100 year anniversary of Aviation in Dade County. It was discussed to put the DRC trailer in the parade. See Miguel if you have any suggestions. The ING Marathon was discussed by Ben Nemser. He is requesting our help for Sunday, January 29, 2012. It is going to be more fun this year. Please see Ben. They are expecting over 25,000 people. Merger of the DRC and SFFMA By-Laws were discussed. Ray advised that the DRC ran the Hamfest and we have more to gain from using the SFFMA By-Laws. Virgil said that the committee has not met. Everyone has been too busy. He suggested using the 1 set of By-Laws and in the future we can merge them. A motion was made by Virgil to keep the DRC By-Laws as they are for now and use the SFFMA as guidance as needed for repeaters, seconded by Glenn. A vote was taken and it passed. Miguel spoke to Ryan and Mike Jasinski about working on an email to advertise our testing. Next month, Armando KG4LYD will be doing next month’s presentation. KK4AJQ will be doing the presentation at the January meeting. Ben Nemser is doing the presentation at tonight’s meeting. The DRC Holiday Party/Award Banquet is going to be the same night as our December meeting. It will take place at Carino’s Italian Restaurant right down the street from here; $25.00 per person and comes with soda. Mixed drinks can be purchased separately. Ryan made a motion to go to Carino’s as the place for the DRC Holiday Party/Award Banquet, seconded by Virgil. A vote was taken and it passed. Another motion was made by Gus to allow Carl to take care of the awards and allow $250.00 for the awards for the banquet, seconded by Harry. A vote was taken and it passed. An antenna was raffled off and Frank won. Congratulations Frank. Ben Nemser WA4DZS gave a very informative presentation on Fiber Optics and Analog, Digital and HDTV. He also did a demonstration on splicing together two wires with a machine. It was very educational. Thank you Ben. Miguel thanked everyone for coming. A Motion to close the meeting was made by Gus, seconded by Carl. Voted and passed. The DRC meeting was adjourned at 21:12.